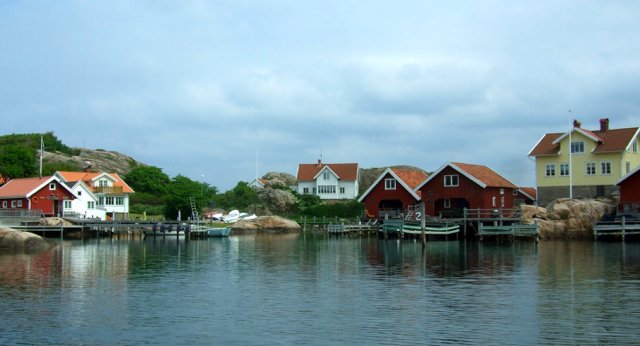 The Bohuslän Coast is Sweden’s western strip, 150 quiet miles of fjords and little inlets, pebble-dashed with 8000 islands, stretching temptingly north from Gothenburg to the border with Norway. Leaving Gothenburg, the plan was to work our way quietly up, deviating to the occasional island, and taking in the many small-scale attractions and wide open country. How do you pick an island from so many? The fun started in Fjällbacka harbour. They whisked us across to Väderöarna in a high-speed boat in 25 minutes. (The delivery trip from Northern Ireland, where the boat was built, must have been thrilling.) From flat-out fury, our speed fell in an instant to a slow crawl as we reached the tiny jetty. For the next 48 hours we didn’t go faster than 2 mph. The Väderöarna (Weather Islands), population about 10, are too small and hilly for even a track, let alone a car. We progressed around the principal island mainly by jumping from rock to rock, climbing the grassy hills to glimpse basking seals. We returned to the guesthouse, Väderöarnas Pensionat, for afternoon tea, set outside on the jetty. The waterside outdoor hot tub was steamily enticing. This is the only place to stay on Väderöarna. You reach the shared toilets and showers on creaky wooden floors. That may sound like no-stars-at-all accommodation, but it is neat and comfy and the Pensionat’s other virtues are beyond any conventional hotel star rating. You won’t find coastal peace deeper than this. Our bedroom had a dreamy view over a serene little inlet. We watched the terns fishing in the harbour before an excellent dinner of local seafood.